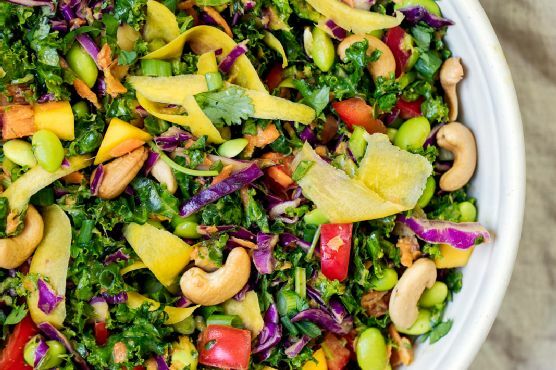 Add chopped kale to a large bowl.In a small bowl, mix together the dressing ingredients: peanut butter, sesame oil, gluten free soy sauce, rice vinegar, maple syrup, lime juice and ginger. Add water to thin if necessary to make a dressing like consistency. Pour dressing on kale, then massage kale with clean hands for 5 minutes in order to tenderize the kale and allow it to sweeten just a bit.Next add in the mango, edamame, shredded carrot, bell pepper, cabbage, cilantro and green onion. Toss to combine. Serve immediately, topping each serving with a tablespoon of cashew halves and additional green onion.